SCHRAEMBL - Karte der Magellanischen-Strasse. . .
SCHRAEMBL, Franz Anton, - Karte der Magellanischen-Strasse. . . Title : Karte der Magellanischen-Strasse. . ..
Map maker : SCHRAEMBL, Franz Anton,. Size : 20.3 x 26.9 inches. / 51.5 x 68.3 cm. Description :Very detailed map of Strait of Magellan, with in top inset map of Southern tip of South America with the Falklands. Incorporating the discoveries of Herrn, Byron, Wallis, Carteret and Bougainville, the map is full of named features on both sides of the straight, including Indian villages, coves, points, inlets, mountains, rivers, etc. Soundings, anchorages, shoals and currents accent the seas. A volcano erupts in Terra de Fuego. Inset map of the full region, including the Falkland Islands, provides larger perspective. 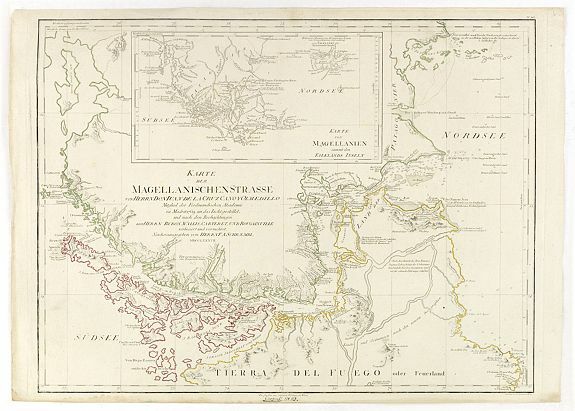 The chart is taken from Juan de la Cruz's important 8-sheet map of South America, which incorporated information from the expeditions Byron, Wallis, Carteret & Bougainville. Dörflinger, Österr. Karten des 18.Jhdts, Schl/49. Condition : Dark impression on clean heavy unfolded paper. In lower margin some light water staining. In very good condition.